The Mini Treat Bag Thinlits Die for the Big Shot is one of my favorite dies. 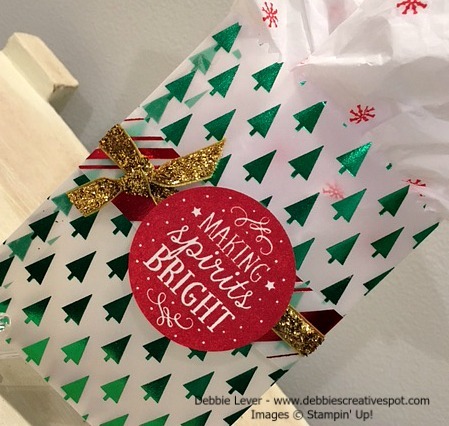 It is so easy to create adorable little bags perfect for treats or gift cards. This little delight was made using the Holidays Fancy Foil Designer Vellum. 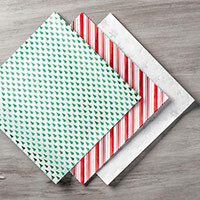 There are three gorgeous designs in this 12x12 vellum pack. Trees, stripes and silver snowflakes. This vellum is on the Year - End Sale right now so be sure to scoop some up before it is gone. You can view all product on sale below. I love how it turned out and I can't wait to fill it with a gift card to give to at Christmas! I also made this little bag and was hesitant to post it......because......if you notice, the antlers are hanging down instead of up. Ugh! I did not notice that until I put the picture here. It's not that bad - right? 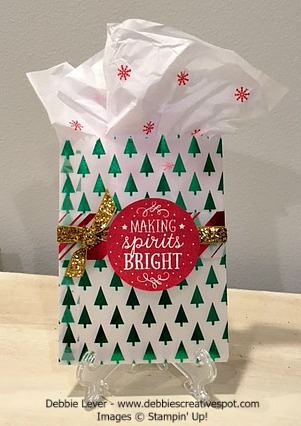 I made the bag with my son in-law in mind to put his gift cards in for Christmas. This is a great example of how important it is to make sure when you place the Treat Bag Thinlits Die on your designer paper, that you put it the right way around so that it cuts the paper in the right direction. 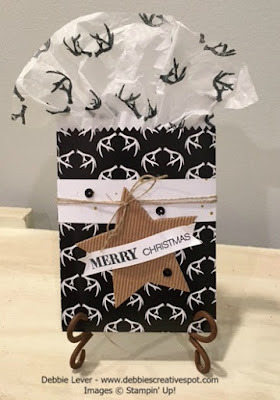 At least I stamped the antlers on the tissue paper the right way around! I used the retiring Woodland stamp set to do that, which coordinates perfectly with the designer paper. I used the beautiful Winter Wonderland Specialty Designer Series Paper, another item on the Holiday Retiring List at a discount. Be sure to check it out! The belly band uses the opposite side of the antler paper. 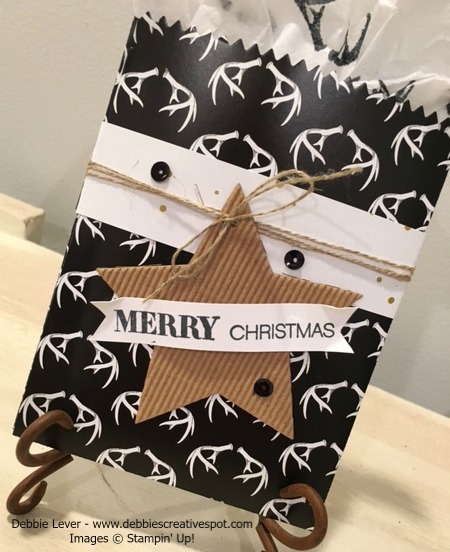 I cut the star using the Stars Framelits and Corrugated Paper. This paper comes in white and kraft. The Merry Christmas stamp is from Holly Jolly Greetings stamp set - a favorite of mine from the Holiday Catalog. A few sequin's from the Metallics Sequin Assortment and Linen Thread finish this rustic design, perfect for my son in-law. I hope he appreciates the design - think he will notice the antlers are upside down?